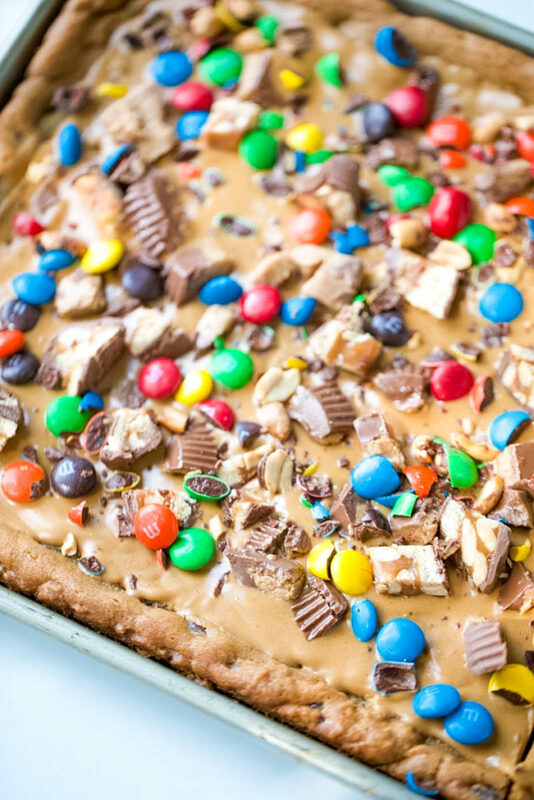 Skip all the hassle of measuring, mixing and scooping cookie dough and create this Chocolate Chip Candy Cookie Bar. 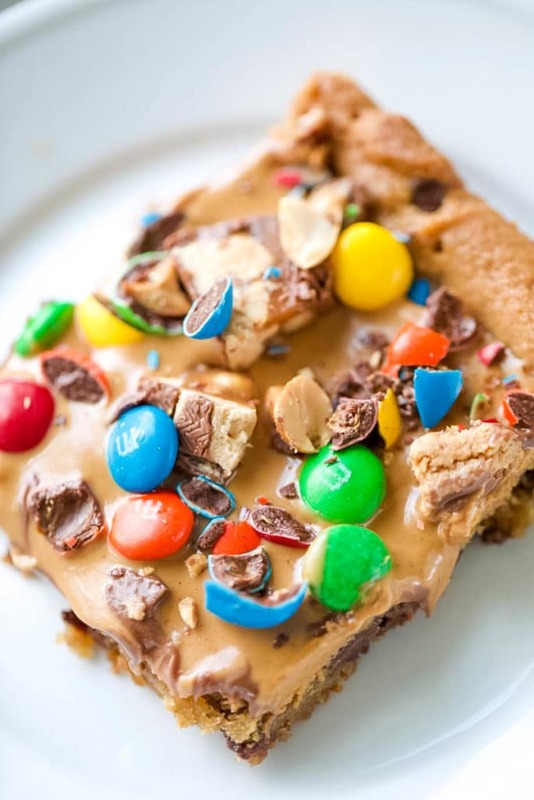 With all the fun flavors of a chocolate chip cookie with loads of candy bar toppings and peanut butter, make these Chocolate Chip Cookie Bars exceptionally special! 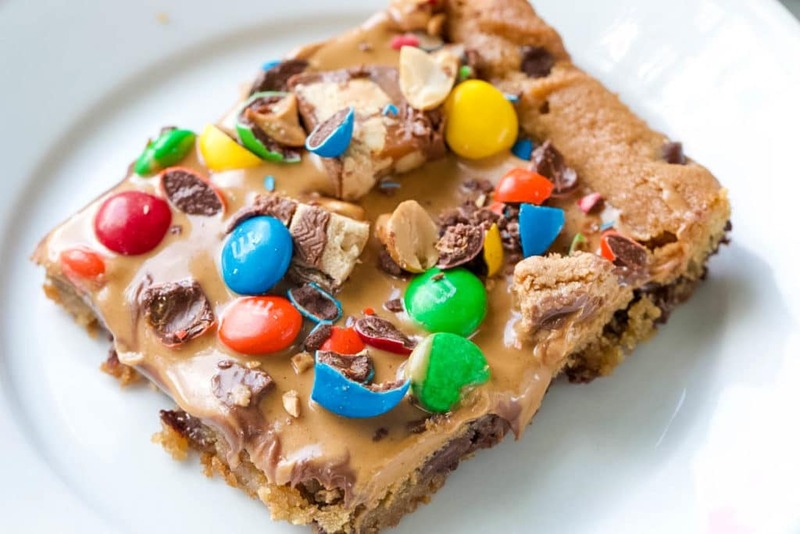 You start with a premade cookie dough base that is topped with smooth peanut butter and topped with candy bars in every single bite. This chocolate chip cookie bar recipe is one of my go-to desserts. 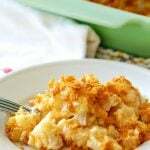 Great for potlucks, bake sales, and to have on hand for packing in the kid’s lunches and after-school snacks. Quick, easy, and absolutely no fuss in making these bars. It’s always the first to go! 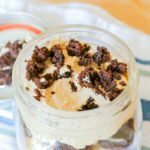 While I love to bake, sometimes I reach for those simple desserts, and this is a lifesaver. 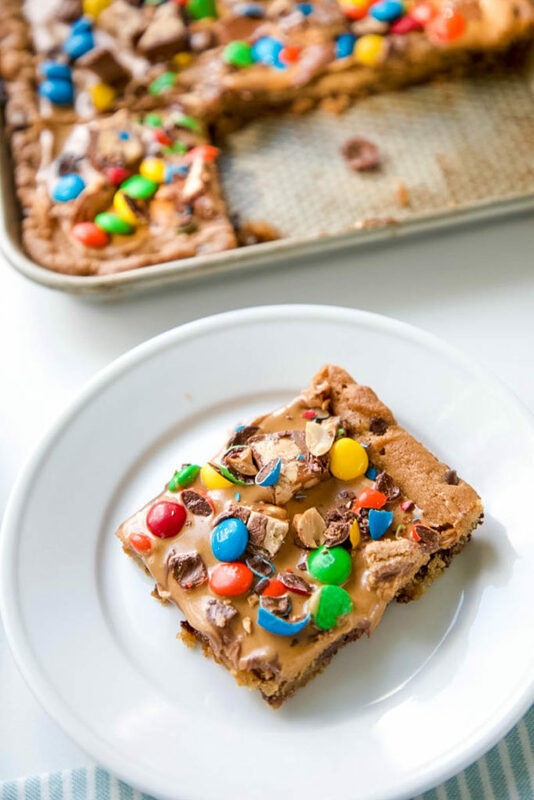 A cookie in a sheet pan recipe that you will want to save in a recipe box for making again and again! Can’t get enough cookies? Us either, check these recipes out! Start by grabbing your favorite premade cookie dough. 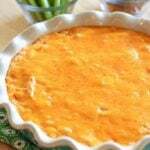 Spread this evenly in a greased 9×13 pan. Bake for 10 minutes or until it begins to look slightly golden brown and cooked through. Top with a few dollops of peanut butter (yes, this is the technical term! haha!) that you can spread over the top of the cookie bar. Then top with your crushed candy bar & candies once it has cooled a bit (or else they will melt). Slice and serve! See how easy this chocolate chip bar recipe is?! A breeze. 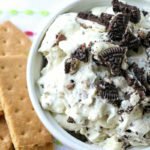 Kids and adults will both rave about the tasty creation. This might be a classic way to tell, but let me tell you it works every single time. 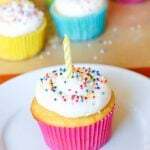 Take a toothpick or cake tester and place in the center of the pan, and push down. If the toothpick comes out clean your dessert is done. I test a handful of areas to ensure it is cooked. Another great way to tell is you will see the chocolate chip bars begin to get golden brown on top. But don’t let them get too brown. A light golden color is what you are looking for. And for the cookie to be a little crispier around the edges. Let’s be honest for a minute. 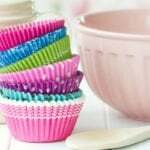 I love to bake, but sometimes I am booked with tasks that I need to check off my to-do list. From taking the kids to school, after-school activities, errands for the home, I am exhausted. I reach for an easy bar recipe, because I can give my kids a tasty treat, and it doesn’t take much time. 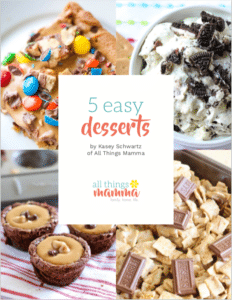 Just roll out the cookie dough, bake and top with yummy goodies. 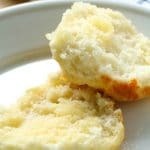 With cookies, you have multiple batches going in, and out of the oven, you can quickly eat up an hour of time. Cookie Bars are so much simpler and require less effort and time in the kitchen. And they’re super fun to eat! 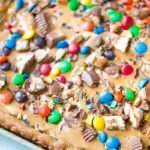 Various Candy Bars - cut up I like to use M&M's, Peanut Butter Cups, Butterfingers and more! 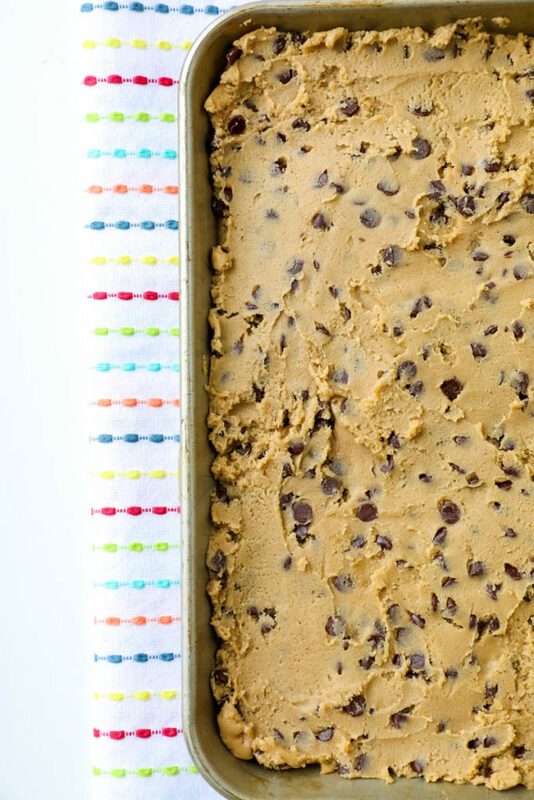 Spread the uncooked cookie dough evenly in a greased 9×13 pan. Next, top with your favorite crushed candy bars of various types. 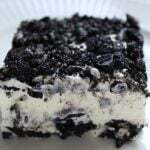 Allow to cool and cut into bars. Are you a fan of making Chocolate Chip Cookie Bars? Do you have a favorite? 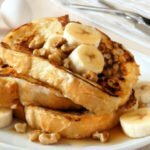 How To Make The Best French Toast Recipe Each and Every Time!